Sawfish are the stuff of legends: Animals that can grow up to 7 m long and have an extended rostrum (the ‘saw’) loaded with teeth. Old newspaper articles have described them as monsters that lurk in our rivers and oceans and are just waiting to attack people. Quite the opposite is true, as sawfish use their „saw“ skillfully in order to stun and manipulate their fishy prey, not caring for us humans. They are magnificent animals, no doubt. Anecdotal reports claim that sawfish used to be so plentiful that people in Sudan once used their rostra as fence posts. Additionally, a study from Lake Nicaragua estimated that between 1970 and 1975 around 60,000 – 100,000 animals were caught in the lake by commercial fishers. This was once thought to be their largest population. A survey in 1992 could not find traces of a single individual in the lake. Today, five extant species are recognized. 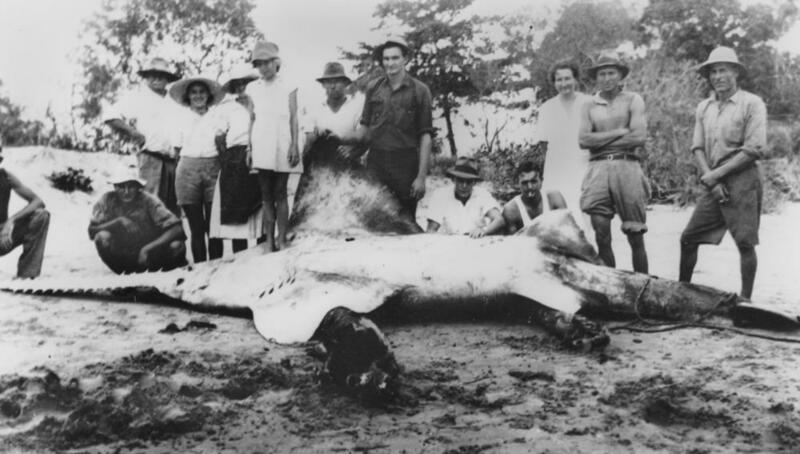 All are either listed as Critically Endangered or Endangered under the criteria of the IUCN, making sawfishes the most endangered of all the sharks and rays in the world. 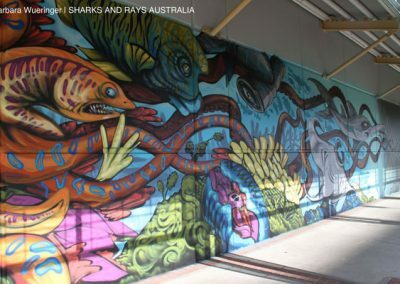 Four out of those five species can be found in Queensland waters, which are thought to be home to some of their last important populations in the world. 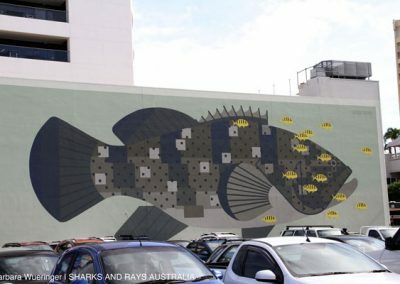 With significant global declines for all species, the question arises, if the rivers and coastlines of Queensland are still a stronghold for these animals? First, we need to engage in a debate about our baseline – how abundant was the species in the past? This search can turn philosophical really quickly. How do we determine a healthy population? What levels do we want the population to return to? Does it need to return to pre-human influence levels or is it enough to keep the population at a level where it can somewhat perform its ecological function? Or is exploitation more important than conservation? 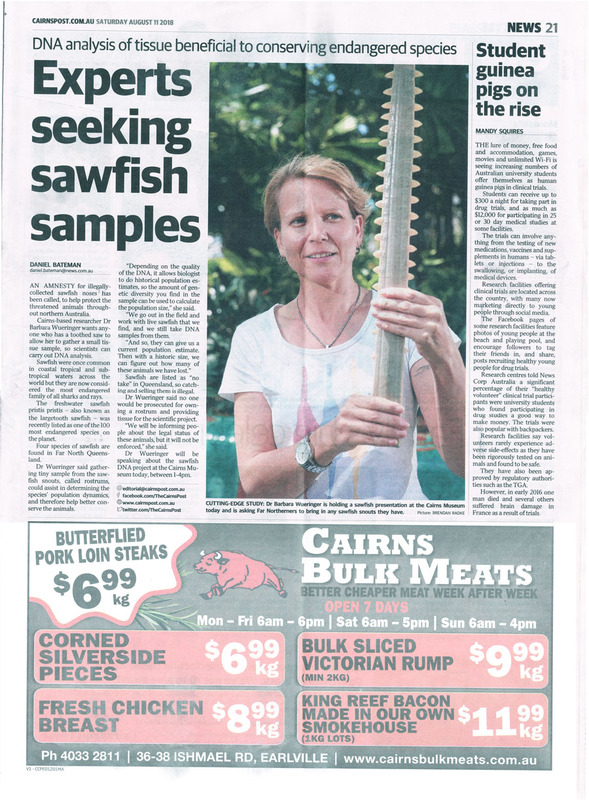 Secondly, we need to determine how much the population of sawfish have declined in Queensland. 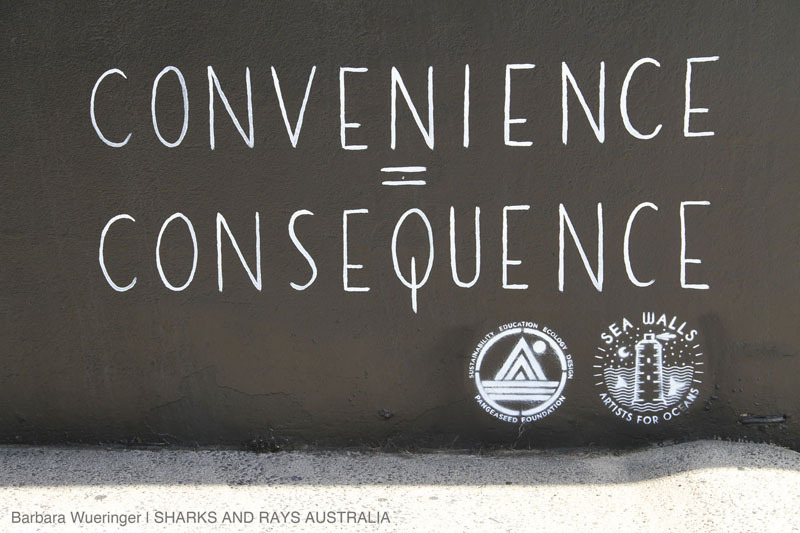 To answer this, sawfish capture data from the Queensland Shark Control Program (QSCP) was analysed. 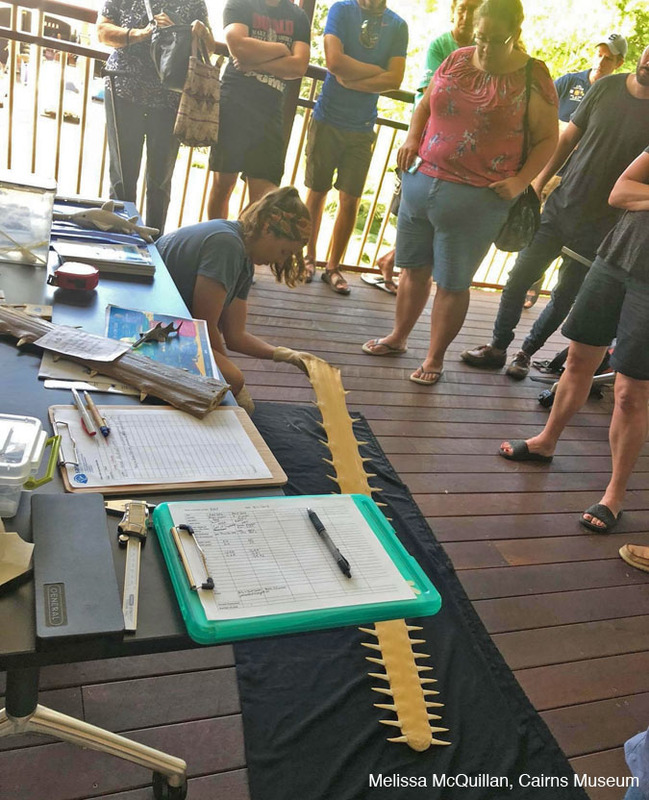 This program started in 1962 and aims to protect swimmers/surfers from potentially dangerous sharks by utilizing gillnets and baited drum lines. Although no scientific evidence exists that the program actually works, it has been in place for decades. 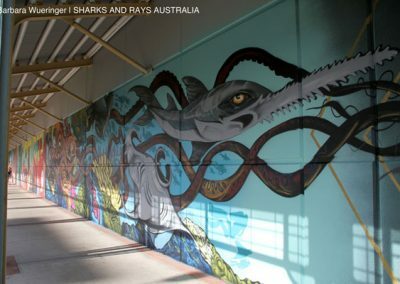 The data shows that between 1962 and 2016, 1450 sawfish were captured,with 99% of captures occurring in the four most northern areas of Queensland’s East Coast, suggesting the existence of critical habitat. Most animals were caught in the nets and not on drum lines. An overall decreasing trend in catch rates was observed for two locations where standardized catches could be calculated. However, standardized catch rates from the data set are likely underestimating abundances, as the nets were set up to 500m away from the coast, in deep waters where they often did not reach the bottom. 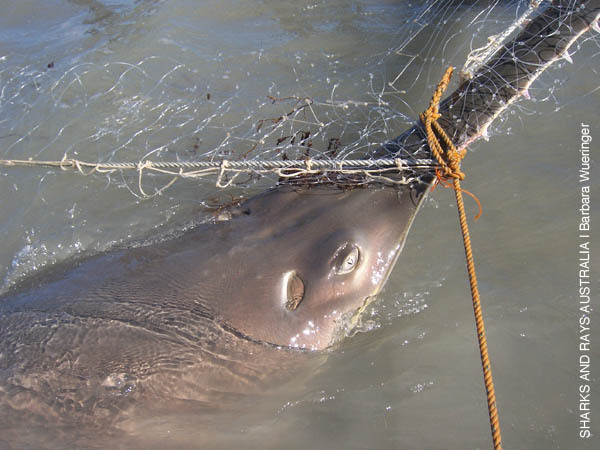 Most sawfish captures occurred near the bottom of the nets. The facts of this data set make firm conclusions on abundance declines difficult, although it is apparent that the declines have been statistically significant. 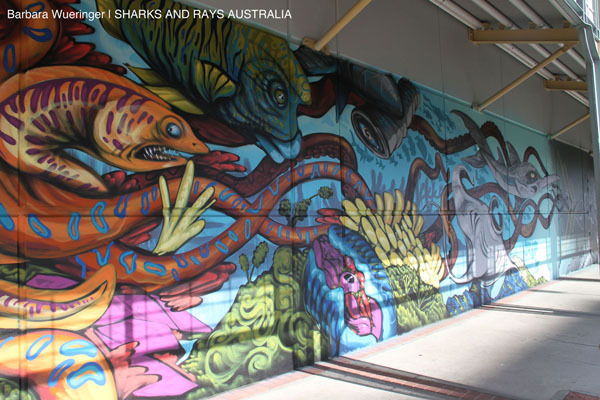 We need to devote more resources to better understand population trends in Queensland’s sawfishes. 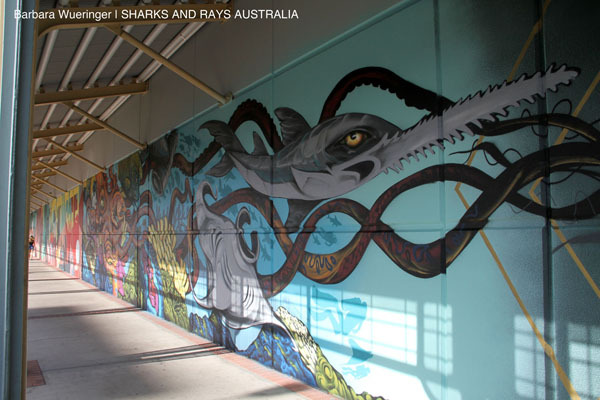 You can access the publication on sawfish catches in the Queensland Shark Control Program here. 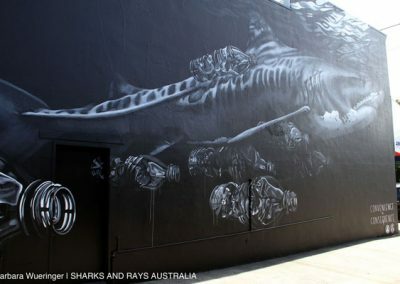 This blog post was originally written for the Save Our Seas Foundation. Access the original blog here. Standardized catch rates for sawfish (fam. 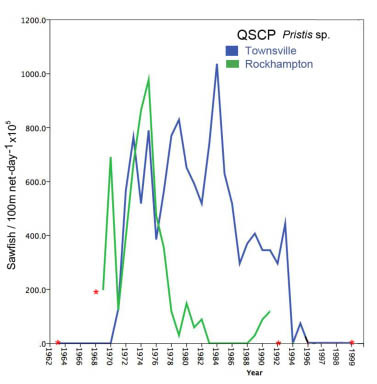 pristidae) in gill nets in two separate locations of the Queensland Shark Control Program, 1962 – 2016. Red stars indicate when fishing began and ceased in the respective location. It’s safe to say, each of us were equally as excited to be part of an all-female team representing women in science. Our international research team consisted of myself (Grace), a visiting Master’s student from the University of York (UK), conducting a two-month internship with SARA, Annmarie, a Master’s student from the University of Mississippi (USA) visiting Australia as part of the #SawSearch project, Julia, an Aussie undergraduate student at the University of Wollongong, and of course Dr Barbara Wueringer, principal scientist and founder of SARA. 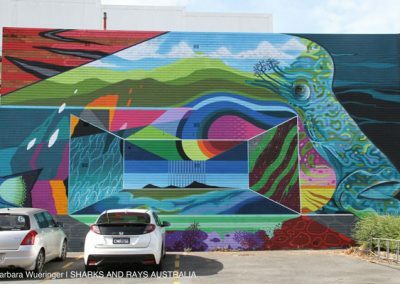 It was now the middle of August and I had been in Cairns since the beginning of July 2018. As part of my Master’s programme I was required to complete a two-month placement with an external organisation. 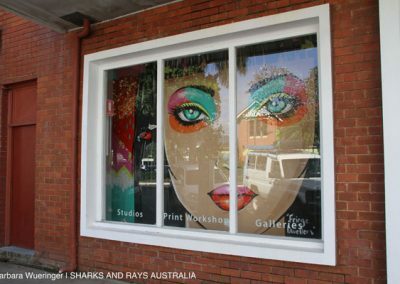 I had contacted Barbara earlier that year and was lucky enough to secure a project, much to my excitement! After skyping a few times, and brainstorming some ideas, we decided I would investigate the effect of environmental parameters (i.e. temperature, tide, salinity etc) on sawfish distribution. 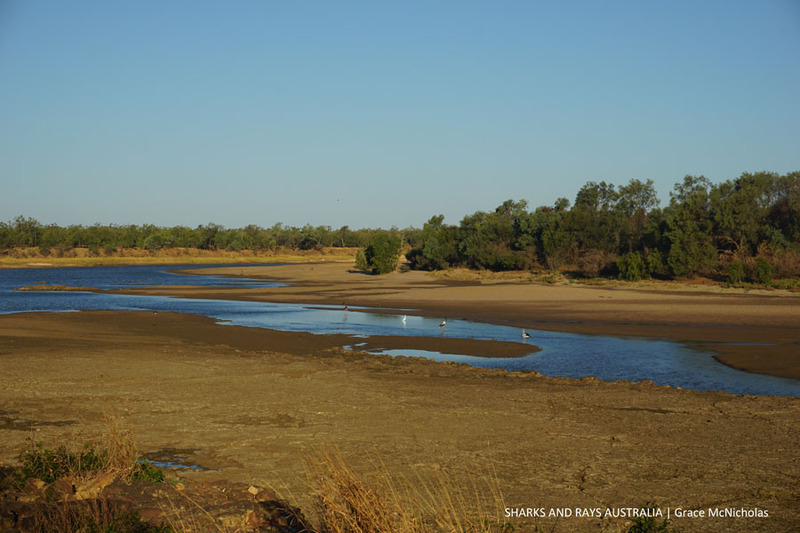 I would be using data collected by SARA over the last 4 years of river systems of the Gulf of Carpentaria. 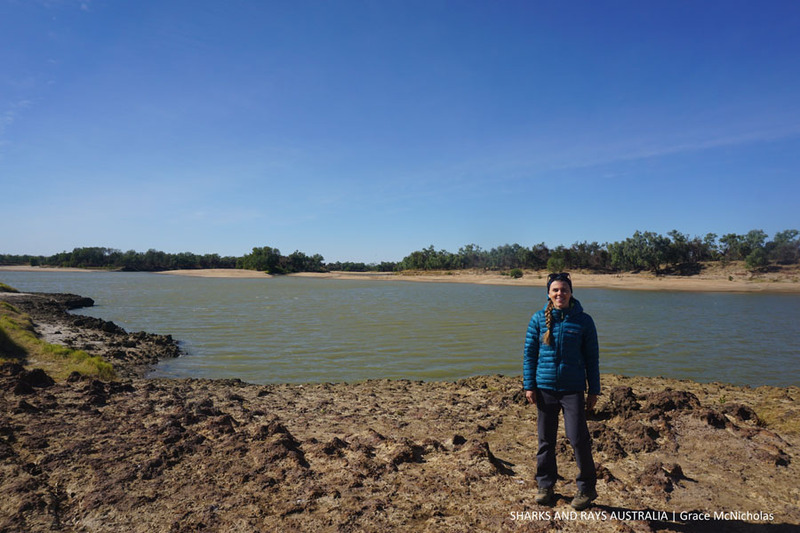 Of course, as grateful as I was to spend two months in sunny tropical Cairns, I couldn’t miss the opportunity to get involved with some data collection myself, so I booked myself onto the two-week Southern Gulf expedition in August and headed down under. Barbara welcomed me with open arms and we soon began to establish a daily routine working from her home office. 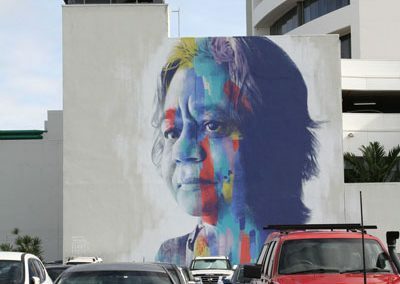 I spent my days working through spreadsheets and analysing data under her guidance. When my eyes started to feel a little bit too square and I needed a break, Mr. Jaxy (Barbara’s adorable dog) was always there for a cuddle. I was loving every minute of working on this project, but I couldn’t wait to get into the field and see for myself how the data I’d been using had been collected. 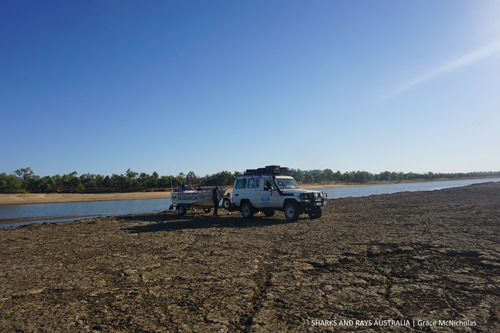 We met on a sunny Monday morning in Cairns and soon began packing up the Troopie and boat trailer with everything we would need to camp and conduct research for the next two weeks. Stuffed to the rafters we set of on our long drive, headed to Normanton on the west coast of Far North Queensland. 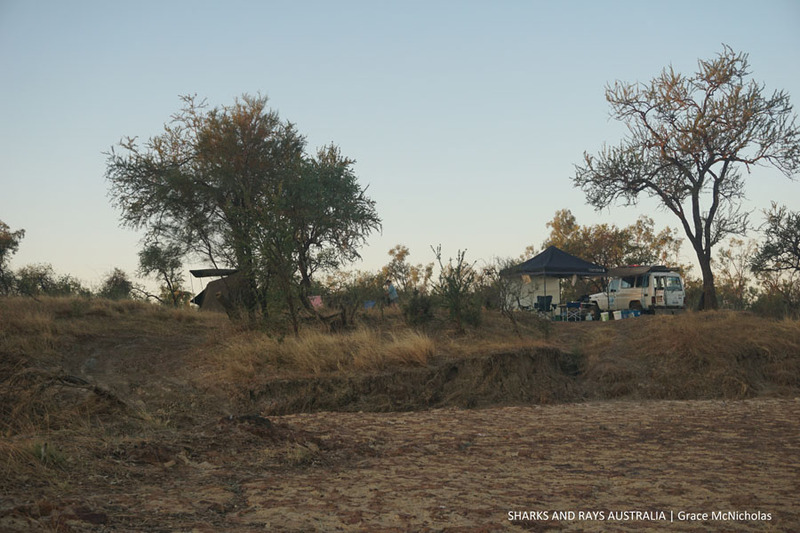 From there we made our way to the homestead of the large cattle station we had kindly been allowed to camp on. Now as an English girl, I had no concept of what a cattle station is or how big they are. 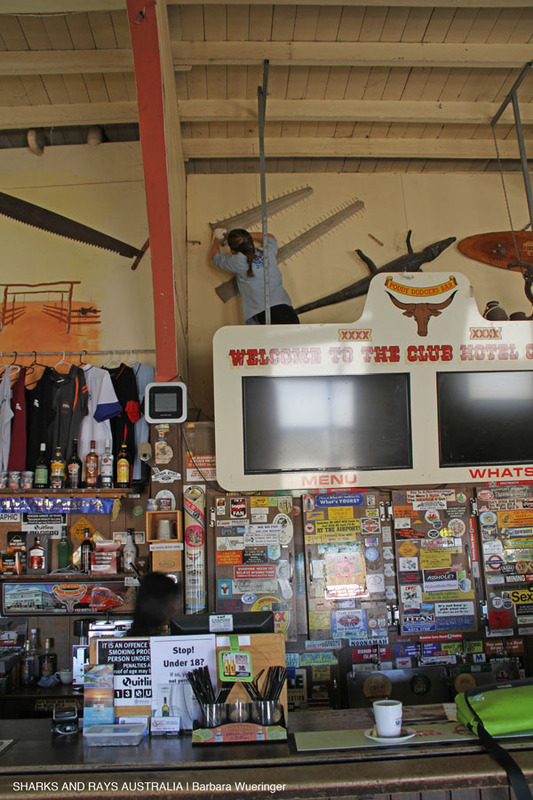 So, for those of you who like me don’t know, picture an American ranch, cowboys and the lot, then add an Aussie twist. We were greeted by the managers daughter and son who gave us directions to a little dirt track which ran parallel to the river and where we would find a clearing we could set up camp. The kids joined us on a sampling session a few days later and proceeded to make fun of me for accidentally calling mustering ‘herding’ and for daring to worry about crocs and snakes. 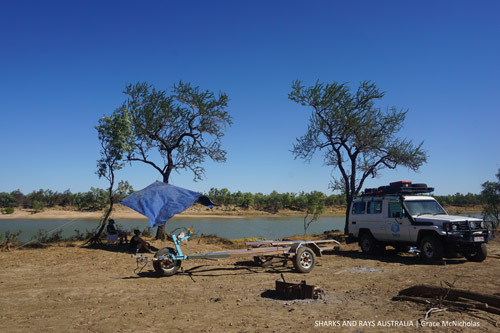 We found the clearing, backed the boat into the river, then after a slight mishap involving a lot of mud, furious shovelling and a tow from the station manager, we were finally ready to set up camp. Being a seasoned expert, Barbara has the whole camp thing down to a fine art. 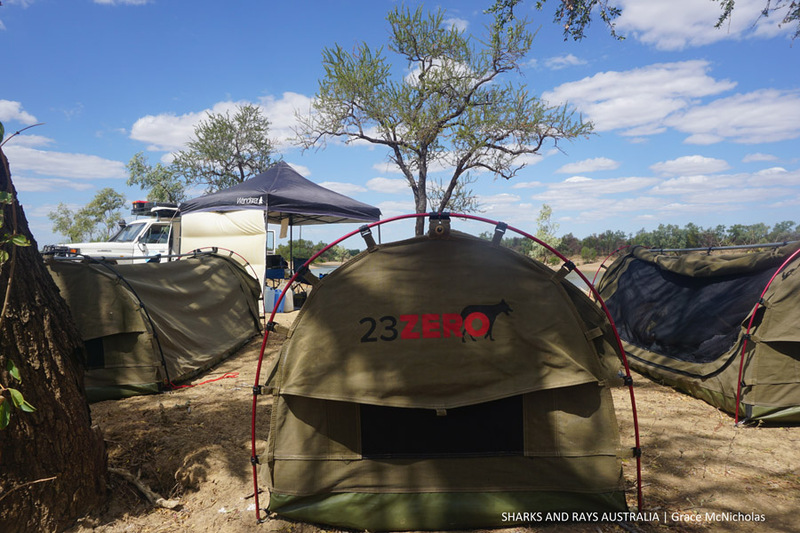 We swiftly erected a large gazebo as a cooking and resting area, two privacy tents (one for our bucket water ‘showers’ and the other for our very luxurious drop toilet), and finally our own private sleeping swags. After dinner, we sat around the campfire chatting and marvelling at the night sky, the buzz of excitement growing for the days ahead. The next day Barbara gave us a research induction and then the four of us set out on our first gillnetting session of the trip. Setting gillnets is an art but after a few questionable first attempts, we soon got to grips with it. 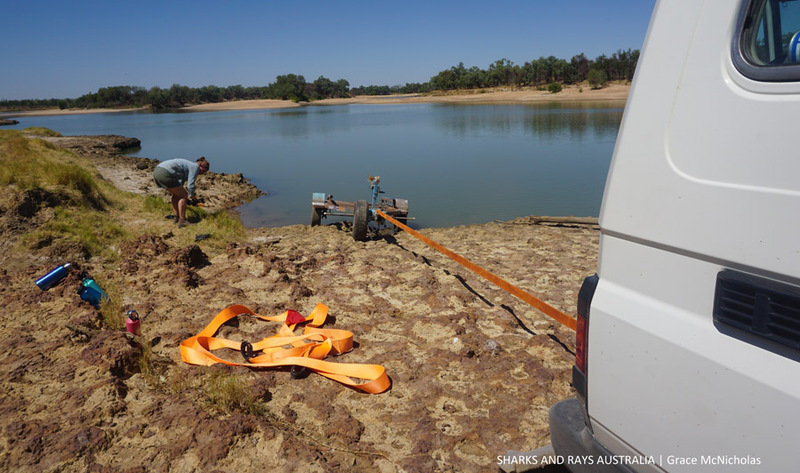 Sampling sessions usually consisted of setting two nets, which were checked every 30 minutes. 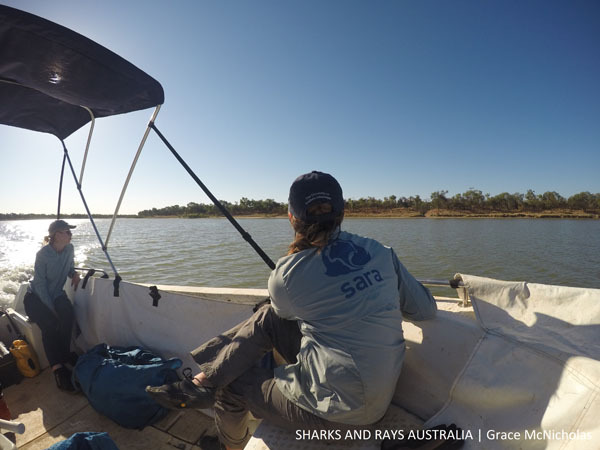 Between checks, we anchored the boat within sight of the nets and kept our fingers crossed we would catch a sawfish, ray or shark. Checking the nets requires some good spatial awareness and team work, carefully lifting the top (float line) and bottom (lead line) out of the water to check the full depth of the net. 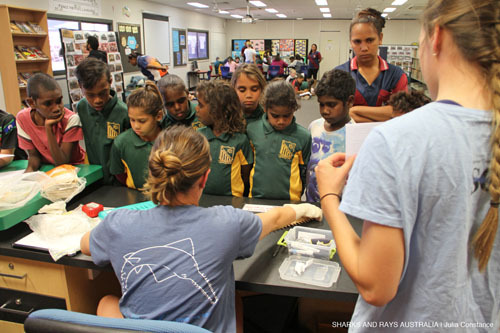 It’s all hands-on deck during these sessions, untangling and measuring fish, writing down data and photographing animals to assist with later species identification. I went from having no prior gillnetting experience to confidently setting and checking nets after just a few days, testament to being thrown in at the deep end from day one and learning on the go. 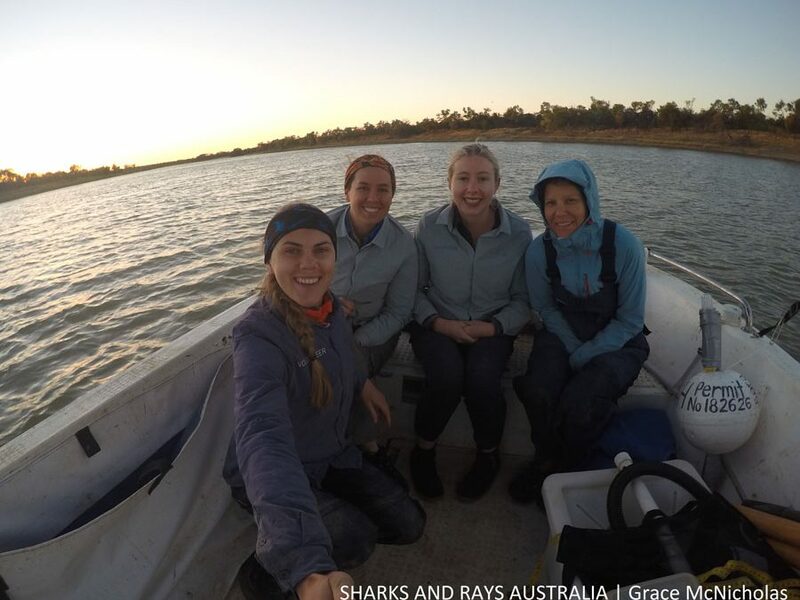 Most sampling is done very early in the morning or during the cooler evenings, as we choose sampling times based on activity patterns of target species and not our own. 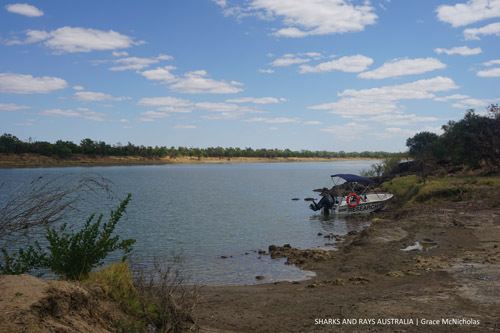 We had caught a range of teleost species including bony bream, barramundi and some very cute catfish, but after three days we still had no luck finding any sawfish or other elasmobranchs. We decided to try our luck elsewhere and relocate to different river. Apparently, the outback had different ideas. 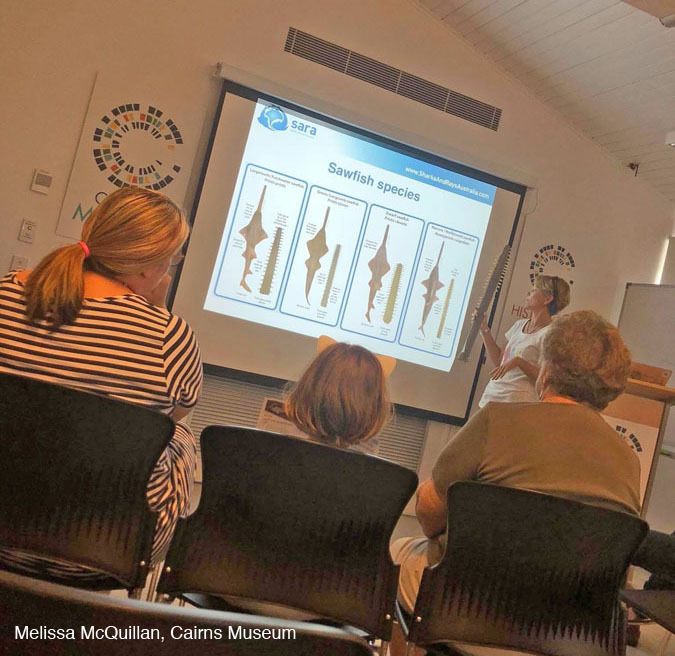 In August 2018, Sharks And Rays Australia and the Cairns Museum jointly organized a sawfish afternoon at the museum, for National Science Week. 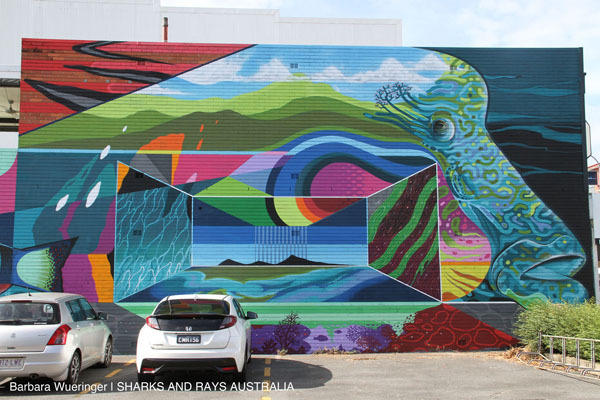 Kier Shorey from ABC Far North radio ran a story, and Daniel Bateman wrote an amazing article for the Weekend Post. I am sure that their contributions had lots to do with the huge success of the event, so we would like to thank them for playing such a vital role in helping us reach the public! More than a month later, we finally finished sampling all the saws from people who responded to the event! This clearly shows that the response was overwhelming and the information collected exceeded our expectations by far! Here are some of our stats: the Facebook event was viewed 6700 times, and we had 21 people who signed up for it on Facebook, while 100 people were interested. The actual turn out was about 40 people and most of them also went to Dr Wueringer’s talk. We also had – and this is the most exciting part for SARA – the opportunity to take DNA samples from 48 saws, including 11 saws that were donated to SARA. Moreover, five sightings of live sawfish were submitted to us. All the DNA samples will be sent to Annmarie Fearing at the University of Mississippi, who will use them for her Masters research project. Many of you met her during the event. 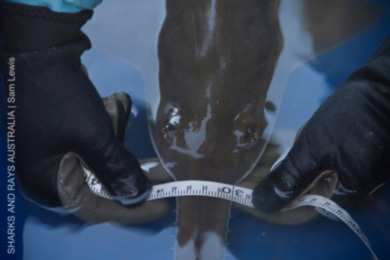 The samples will help to identify if and when the genetic diversity held by different species of sawfish decreased. The project also aims to identify which regions globally hold the highest genetic diversity of the different species of sawfish. These regions will then be named as hotspots and should thus be a conservation priority. 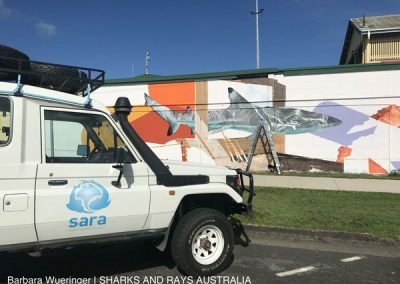 For the saws that were donated to SARA we have big plans as well, which we are currently discussing with the Department of Agriculture and Fisheries in Queensland. 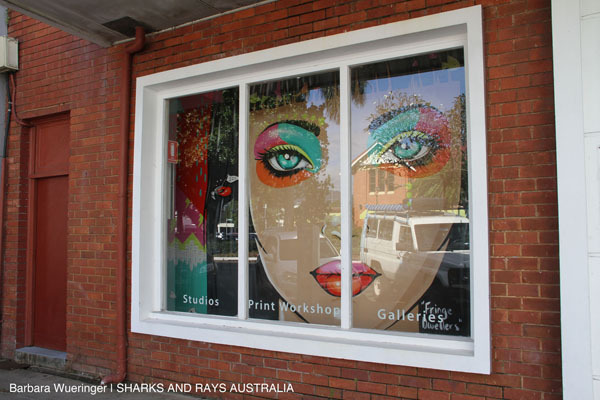 While we use some saws for our school visits, we want to see the other saws on display in tourist information centres, museums and pubs in Far North Queensland and the Cape York region. 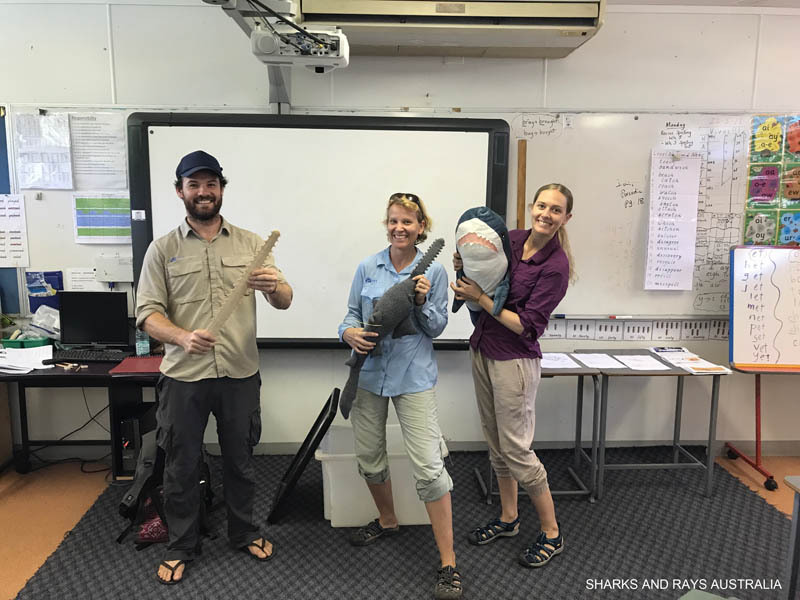 Displaying these saws together with information on the conservation of sawfish and where to submit sightings means that these former trophies can become active contributors to sawfish conservation in Queensland! So with this I would like to thank everybody who made this event possible and who responded to our call and brought their saws in. I would also like to thank Grace McNicholas from York University for helping with the sampling and Annmarie Fearing for involving SARA in her project. This project is ongoing, so if you have a saw at home that we hve not sampled yet, then please get in touch! 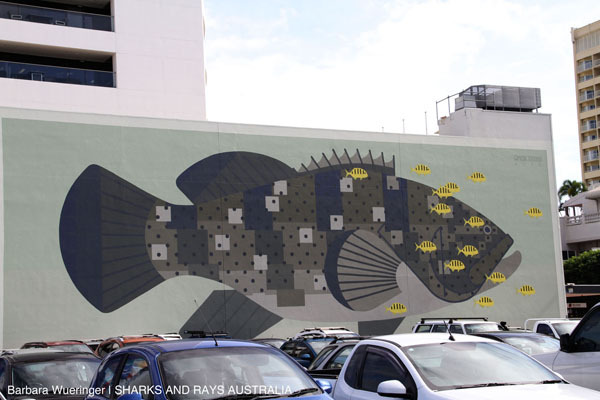 Sharks And Rays Australia and the Cairns Museum are teaming up for National Science Week 2018 and we’re asking you to help us to gather information on the occurrence of some of the largest but rarest fish in Far North Queensland’s waters! Sawfish were once common in coastal tropical and subtropical waters around the world, but now they are considered the most endangered family of all sharks and rays globally. The freshwater sawfish Pristis pristis, which is also often called the largetooth sawfish, was recently listed as one of the 100 most endangered species on the planet by the IUCN (International Union for the Conservation of Nature). This is just one of four species of sawfish that are found in the waters of Far North Queensland. 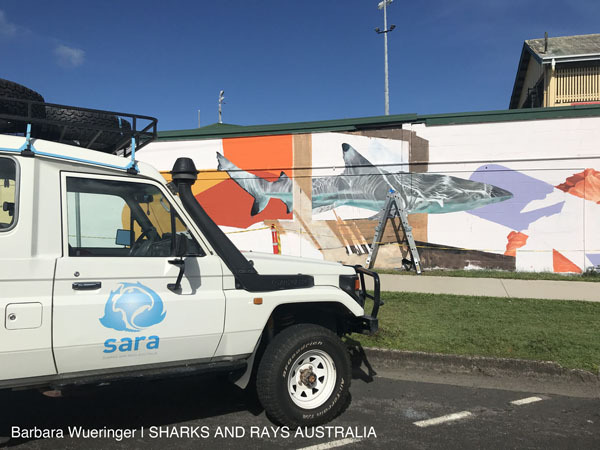 During the afternoon, Dr Barbara Wueringer, the lead scientist and founder of SARA, will be giving a public talk on all things sawfish, including their biology, local history, current situation and threats. 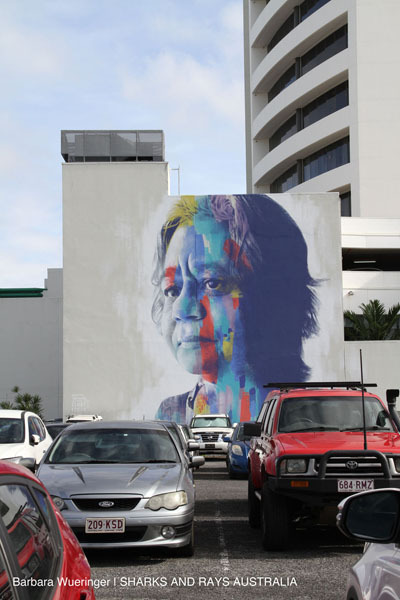 Their cultural importance for Indigenous groups in Australia and elsewhere will also be highlighted. 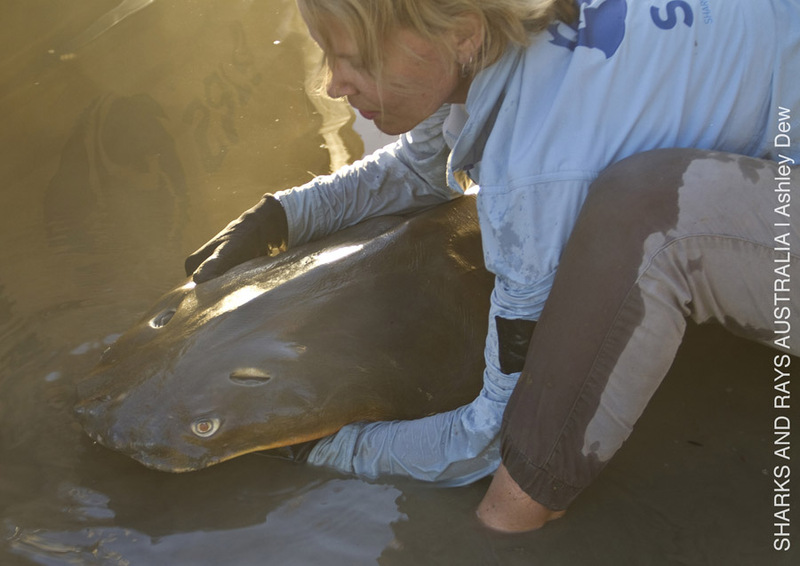 Dr Wueringer will be joined by Ann-Marie Fearing from the University of Southern Mississippi and the Sawfish Conservation Society, who will shed light on how a tiny DNA sample from an old saw that you might have at home can help our conservation efforts for sawfish. Do you have a saw at home? Please bring it with you to the talk! We would like to take measurements, small tissue samples for genetic analysis and hear the story of where it came from. You will receive a certificate that your saw has been sampled, complete with a sample number, which will allow us to report our findings back to you. 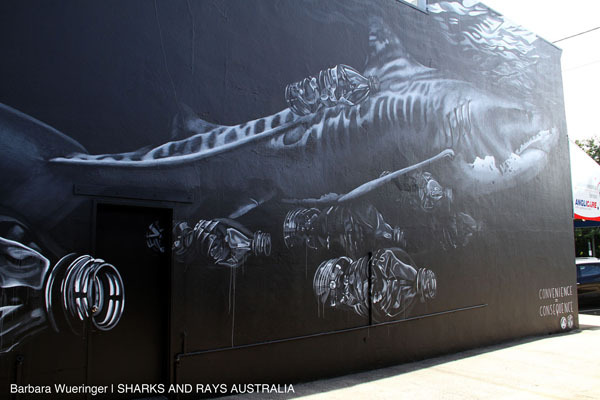 Please do not attempt to remove a saw from a live sawfish for this! When: August 11, 2018 from 1pm until 4 pm. Dr Wueringer’s public talk will be held at 1.30pm and repeated at 2.30pm. Confirm your attendance through our Facebook event here! you can also find the National Science Week event page here!